For any of you that saw the news from a few days ago, you might have noticed there was a bit of snow that fell on New England. Perhaps more than a bit. We did get pretty well buried, but fortunately maintained power (and Internet, as we surely would perish without being able to be online). Lots of digging out, and wouldn’t you know it, we have another snow storm heading our way tomorrow. Not blizzard conditions mind you but we certainly are living in a wintery wonderland. And, with the winds, the drifts of snow have been rather significant. 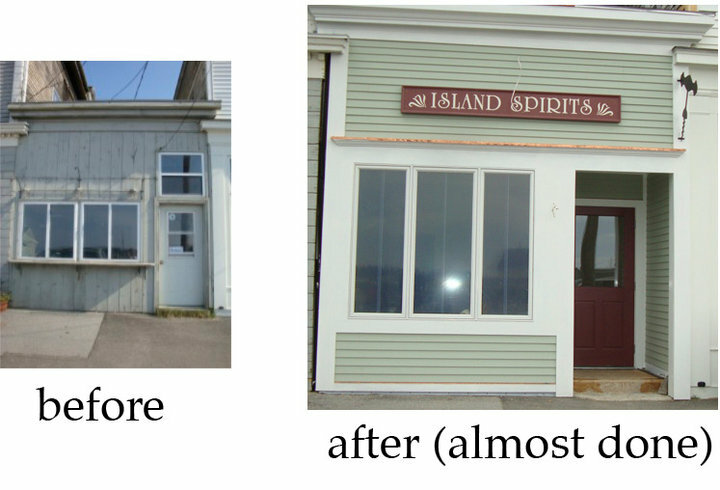 Check out the front if Island Spirits! Well, it looks like we are in for a bit of snow. Some reports are calling for 2 feet and blizzard conditions, and that is on the coast. A little further out, you just never know. So, in all likelihood we will be having winds of 40-60 mph, and perhaps a little stronger, and more than light dusting of the white stuff. I have brought up firewood, and we made sure we had enough wine. So, we should make it through. Of course, there is always a chance that the weather people are wrong, and the blizzard could miss the island. Okay, probably not a chance, but one can hope. If, after we dig out in the morning there are any corkscrews found, I will report back here. Several years ago, the lovely personal personal trainer and I purchased a small commercial building on Vinalhaven. And, over the course of many months, the old bank vault that building housed, was dismantled, the steel insert dismantled, and the old subfloor ripped up. We replaced stringers, insulated, installed a new subfloor, rebuilt walls, and then one early morning, cut away the front of the building and replaced it with a new facade that we had been secretly constructing inside that very building. Our thought, was if we did it early enough, we would have it installed before most of the island made their way into town. Mostly (we needed to make some adjustments for it to fit). And, of course there was a new roof, new electrical, new plumbing new sheetrock and ceiling. New (reclaimed) wood floors, and when was all said and done, a decade long abandoned, and quite dilapidated, building was read for reuse. 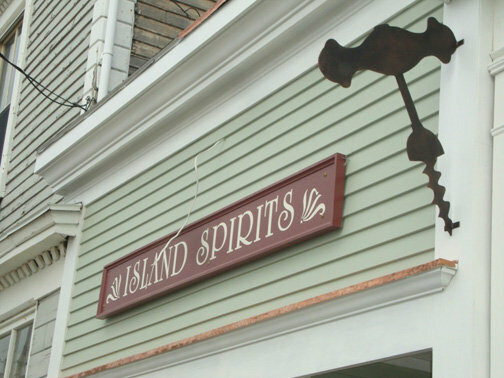 After a steel sculpture of an antique corkscrew was attached, Island Spirits, the wine shop from across the street, picked up and moved into the space. About a year after moving into the space, the owner of the shop, suggested that the lovely and I take it over and run it ourselves. And, every year since, he has made the same suggestion. Finally, this year, we decided to go for it. 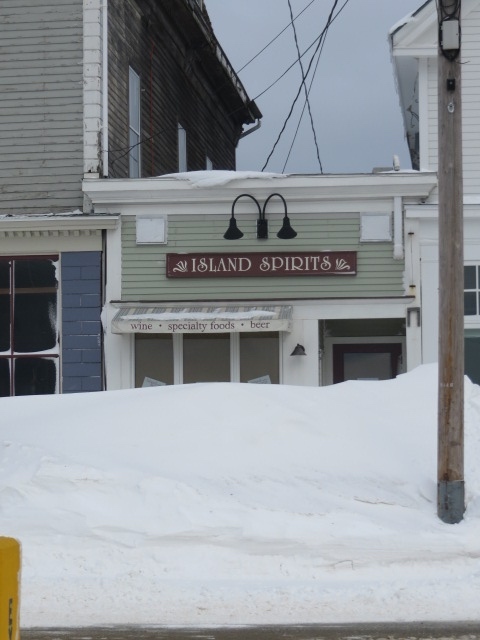 And, so, as of January 1, we are the new owners of Island Spirits, a purveyor of wine, beer, cheese, local island grown produce, and some interesting noshes and delectables. We are super excited about the entire venture, and over the last week, I have redesigned the logo, to include a corkscrew. How could I not? The next few months will be spent with a little re-design of the space, fresh paint, a new square register system, and of course, lots of wine tastings for the lovely and I, as we restock the store and re-open in May. Stay tuned for more Island Spirits updates, and all things corkscrew! 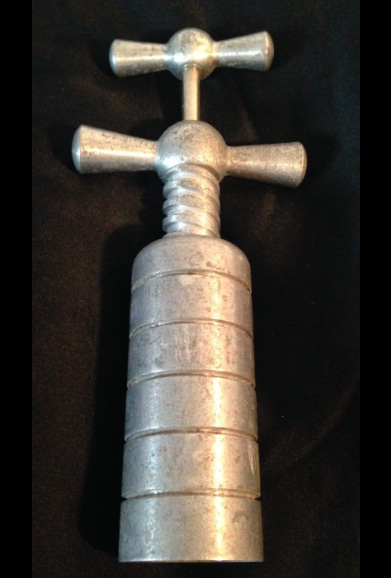 Throw the plate and worm into its most open position by pressing up back of plate, turn the worm into cork until shoulder of plate touches top of bottle, hold plate against neck of bottle and press handle down as illustrated; the powerful lever action raises the cork with ease. 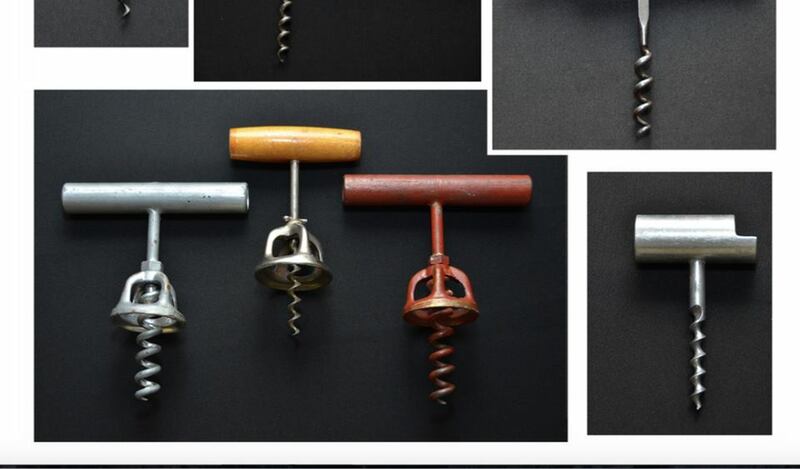 At the Chicago ICCA AGM, Don Bull gave a fantastic presentation on Chicago corkscrews. When I first contacted him asking if he would put together the presentation, I had no idea the depth to which he would go, and the amount of corkscrews that find their origins in, or have something to do with, Chicago. 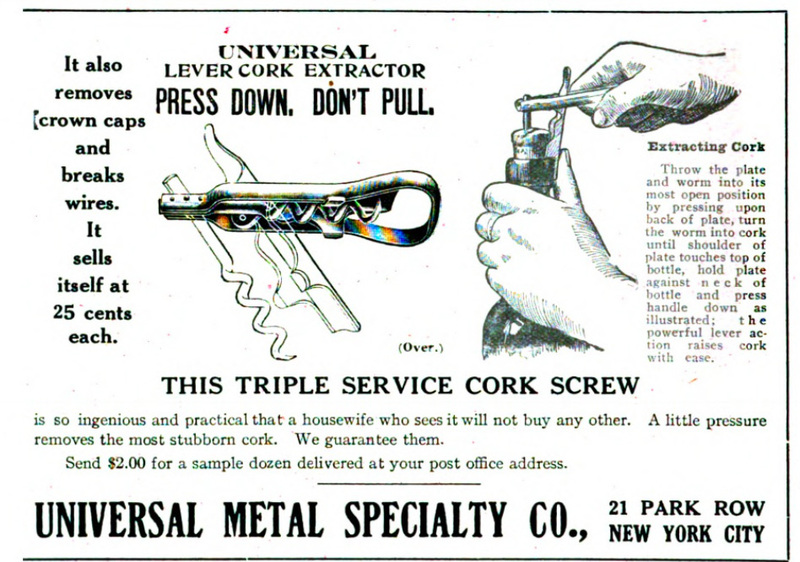 One of the corkscrews mentioned in his presentation was one made by the O’Brien Machine Company of Chicago. These haven’t turned up very often, and I have wanted to add one to the collection for some time. Just December, one sold on eBay. I was following that one, and I did bid, but got outbid by a few others. 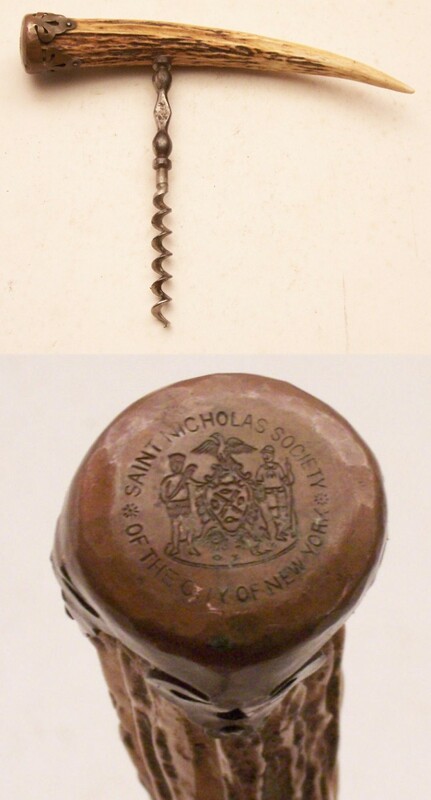 It wasn’t that high of a price in the grand scheme of things, and the Silver Knight Cork Puller indeed brought a fair amount more on the CollectoCorkscrews.com auction last February. No worries, I figured at some point, eventually another will turn up. 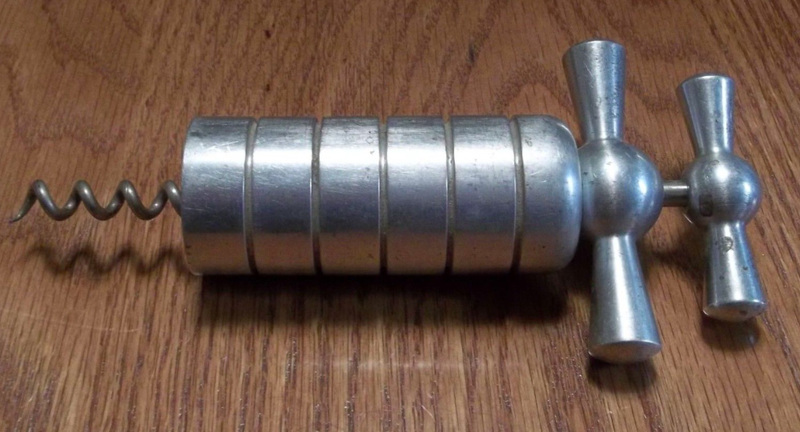 A couple of days ago, another O’Brien Machine Company corkscrew showed up on eBay, and it sat there for a couple of days with an opening bid of 49.99, but no bids. Then, yesterday, suddenly a Buy it Now for almost the exact same price as the previously sold O’Brien appeared. Obviously the seller had done some research. I hemmed and hawed for a couple of minutes, and decided, what the heck. You got outbid on the last one, why not go for it. 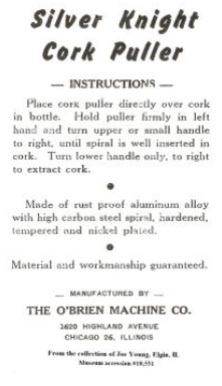 And, soon enough, as the Silver Knight Cork Puller as the ad would explain, a “…rust proof aluminum alloy with high carbon steel spiral, hardened, tempered, and nickel plated,” corkscrew whose, “Material and workmanship is guaranteed” by The O’Brien Machine Co. of Chicago will be on its way to the island. Whilst doing a little corkscrew search this morning, I ran across a non-eBay listing for some Sterling pieces from a manicure kit. 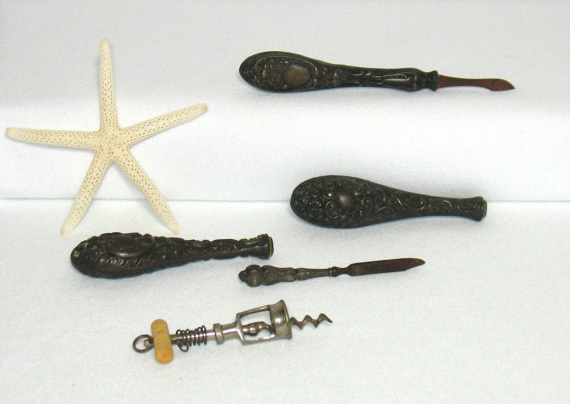 And, pictured adjacent to the three Sterling handled pieces, was one of those miniature Hercules corkscrews with bone handle. I looked closely at the images provide, and the spring looked a little less than perfect. Still, a decent little thing to pick up. But, do I really need a few extra Sterling handled non-corkscrews? I started reading the description, and the seller, recognizing that the corkscrew didn’t go with the Sterling set, added that the, “…corkscrew is incidental…” and had little value. So, I sent the seller a note, and she responded in short order with a nice price for the corkscrew alone. Before the deal was complete, she asked about the significance of the corkscrew. 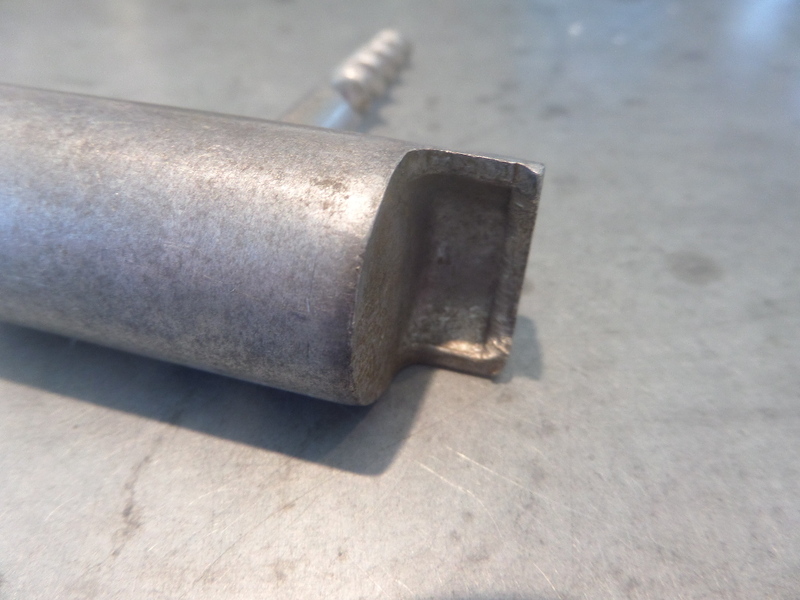 I explained that it was a miniature Hercules type, and that the spring looked to be unsprung, and while not super valuable, it was a neat enough thing. After friendly exchange, a price was agreed upon. And, she promised to send pictures if she finds others, incidental or not. Last week, an interesting corkscrew was listed on eBay, and while it is definitely a patented corkscrew, it is a rather obscure one (from the back of O’Leary) but it was included in John Morris’ presentation on new American discoveries at the Chicago AGM a couple of years ago, as well as in the 2009 O’Leary update that you can find on Don Bull’s website. 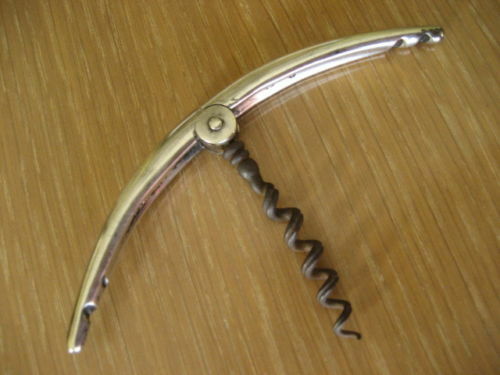 A simple folding corkscrew, it is made of Sterling, and marked for Gorham. And, being marked for Gorham, you might get some Gorham collectors going after it, but I had hopes that most wouldn’t recognize the piece, and perhaps, just perhaps, it might slip through. 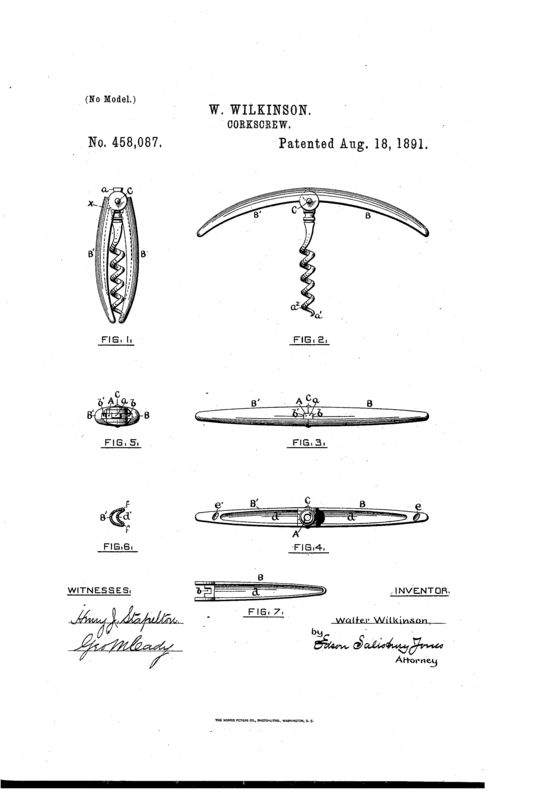 Of course it wasn’t going to, as Tommy definitely has been focusing on obscure American patented stuff, and not only was he at the same presentation at the Chicago meetings, we both examined John’s Wilkinson patent when we visited John and Martha in Tennessee. 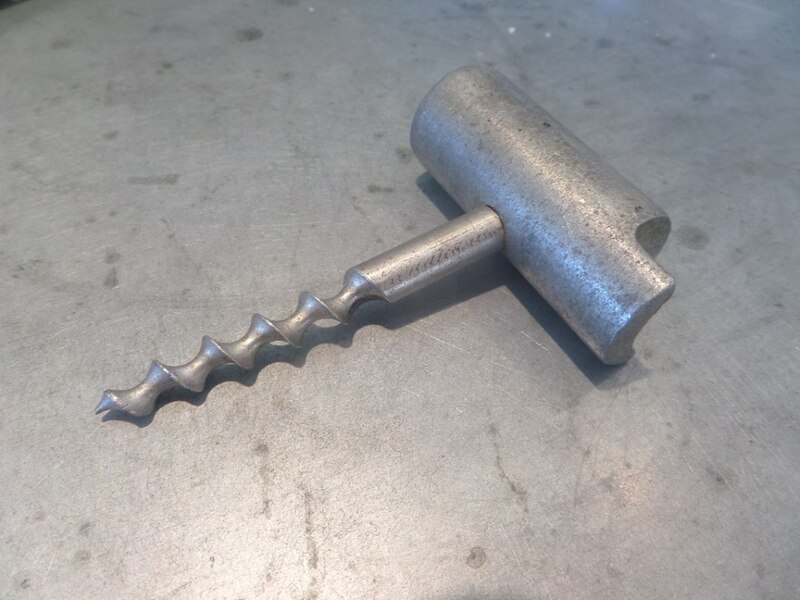 I will add here, that one of the cool features of this particular corkscrew is that the interior of the handles are notched to match up with the turns of the corkscrew; a pretty neat design. And, wouldn’t you know it, in short order there was a bid from the Syrocokid. Okay, it definitely isn’t going to sneak through. Over the course of the ensuing days, I would check on the listing, and see where the bidding was heading. And, with one particular bidder who apparently likes to keep bidding it up in five dollar increments, it seemed that Tommy was still in the lead. Now resting comfortably at $255, was Tommy done? Having not discussed it with each other, I held back, and waited until the final day. 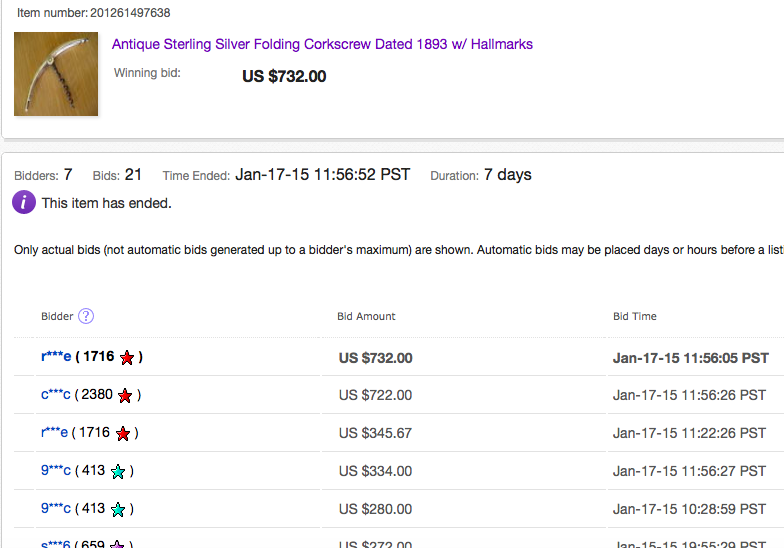 Another bid, and another bid, and now it was at $277. And, the other bidders weren’t TC. Looking closely at the pictures, I weighed my options. Should I enter the fray? And, of course it was well-marked. Wilkinson was actually a designer for Gorham, and his patent was assigned to that company. After considering the piece, and with about 31 minutes to go, I placed a snipe bid; a fairly high one at that, and then headed off to take Philos for a walk. When I had returned, there was about 3 minutes to go, and the Wilkinson had gone up a bit. And, as the seconds wound down to about 20, the snipes would soon be coming in. With 10 seconds to go, my price was taken out, with the high bid ending at $732.00. And, who was the underbidder, our own Syrocokid. Truly a valiant effort TC, and I wish one of us would have gotten it. But there is no joy in Mudville – the Syrocokid and Iwascorkscrewed have struck out. Huge but handy corkscrews, with buck horn handles, were given as souvenirs. Sixty-eighth Annual Celebration is Held in Delmonico’s—Geroge C. De Witt Presides. The St. Nicholas Society held its sixty eighth annual dinner last night in Delmonico’s. The banquet hall was lavishly decorated with orange and black. The Stars and Stripes were in no way neglected. They were every where in evidence. George C. De Witt, the presiding officer, in his opening address told something of the Dutch stock, and mentioned incidentally that it was not dying out, as evidenced by many sturdy graduates of Yale and Harvard, and incidentally a certain young man of Princeton named De Witt, the “champion of Old Nassau.” Yale and Harvard men and the men of many universities and colleges joined in applause at the mention of the Princeton Captain’s name. The President of the United States and the Governor of New York were honored in toasts that were pledge standing. Mr. De Witt, before introducing the first speaker of the evening, said that one of the chief purposes of the society was to prove that the spirit of St. Nicholas never dies, and that he is chiefly in mind about the time the people in the woods begin to cut down Christmas trees. Long pipes, after the fashion of the Hollanders had been passed among the company, the descendants valorously drawing on them. One elderly diner remarked in a voice loud enough for many to hear that he had attended twenty-nice dinners and had reached home without braking one of the clay pipes, and that he expected to to as well this year. The pipes were hanging in his studio. His health was drunk, and then two little pictures of life in the Netherlands were handed out to each guest. They were presented by John Rutger Planten, Consul General Consul of the Netherlands, in honor of the two hundred and fiftieth anniversary of the charter of New Amsterdam as a city were handed to each guest. Huge but handy corkscrews, with buck horn handles, were given as souvenirs. The Rev. William T. Manning was the first speaker. He dwelt on the position America held among the nations of the earth. R. Fulton Cutting, in answering to the toast “Our City,” said that New York was the great centre for good and evil in influencing other cities. Tammany Hall, the Horse Show, and Coney Island are potential for good or evil. For the benefit of marking that in the last half century the political life was not equal, or comparable, with the individual life of the citizens. In conclusion Mr. Cutting said that whatever criticism might be made of the present city administration, it had in an unparalleled way tried to broaden its work in behalf of the minority. Happy Birthday to the lovely personal personal trainer!!!! At the ICCA Annual General Meeting, during the show and tell portion of the program, there was an interesting little aluminum corkscrew presented, that had a bottle opener on the side. Looking somewhat like a shop project, it was fairly well thought out, with the little lip on the edge which would have facilitated the removal of a bottle cap. You can see it in the lower right here. One of a kind? The only one made? A shop project at some point? It is always interesting when suddenly a second example shows up! And, just the other day, I ran across the same piece. Do any of you have a third (or fourth) example?